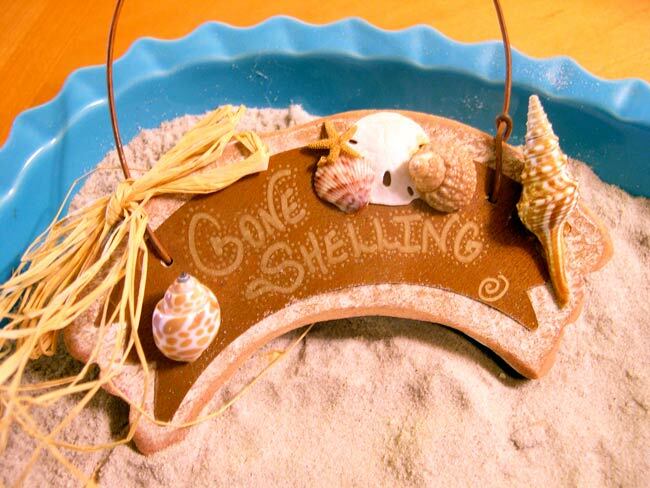 Shellbelle's Tiki Hut: Does Your Home Have A Name? Hi, my name is Shellbelle and I'm a shellaholic. I've not been shelling for 14 days. Trust me, I'll never get my 30-day shell chip. In February, my dear friend Maya of Completely Coastal and Daily Vitamin Sea, wrote on one her posts, "Did you know that attaching shells to objects such as frames, mirrors or pieces of furniture is a practice called Coquillage?" Maya said she had never known that and I must admit that I had never heard of that either and heck, I'm always gluing shells to stuff! She writes that, "Coquille is the French word for shell and the art of Coquillage goes back to the Rococo period of 18th-century France when the shell motif was popular as a carved decoration." I really liked this new word Maya had taught me and it kind of stuck in my head. Then I was reading "back" on some posts a new blogger friend had written and I came across this question, "What Exactly is Cottage Style?" Marie of Sally Lee by the Sea wrote, "Technically speaking, Cottage Style isn’t really a style. After all, a cottage is meant to be lived in, to be enjoyed, and is usually the recipient of all the cast-offs from the real home." Note: Marie found a great article on Cottage-style decorating that she writes about. Very informative, so be sure to stop by and read her entire post. AND then I was visiting Kathy over @ Native Mom and she wrote, "Now I'm thinking that if your house has an official name, it's not a house it is a home." I refuse to be reduced by it." So, now that the name has been decided upon I thought I would show you a few of my coquillage pieces and other seashells in my new home. Mind you, I've only been here for less than two months, so I have a lot to do. As I paint, repair, find some new furniture, carpet and such…I'll be showing you the transformation and asking for a lot of advice. 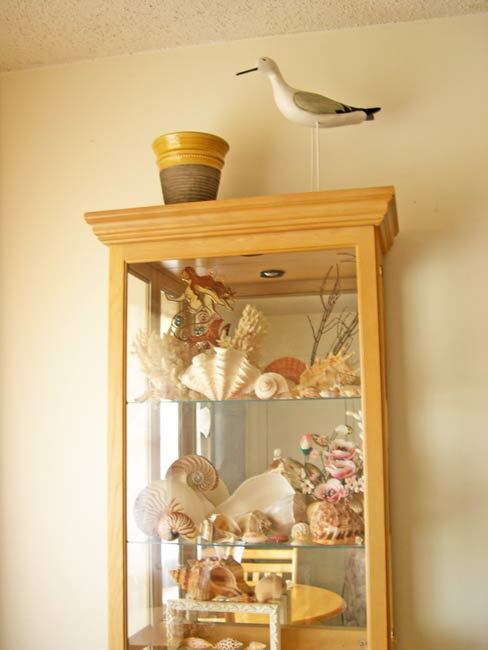 First, when you walk in the door and look to the left, you'll see my seashell display case. In here I store my absolute favorites, well most of my favorites anyway. I broke two of the glass shelves shortly before the move, so a trip to the glass store is on my list of many things to do. This collection contains shells I picked up at the beach, shells picked up at a seashell store and those shells sent to me by friends from their favorite beach. I especially love the ones sent my friend Michelle, all the way from Africa when she was serving in the Peace Corps. This was a project for a Flora and Fauna of Florida class I took in 2005 at Saint Petersburg College. I loved it so much, I've had it hanging in my house ever since. Each shell has been tagged with its common name, its scientific name and the family it belongs to in the Phylum Mollusca (mollusks). This piece has really come in useful when visitors want to know what kind of shells they found, I just refer them to the wall. By the way, I got an A+++++ for this project! Here's a closer view. The little Florida dish belonged to my mother. I love vintage souvenirs from beachy places and have a small collection. I'll save that for another day. Okay, here's a couple of coquillage pieces. 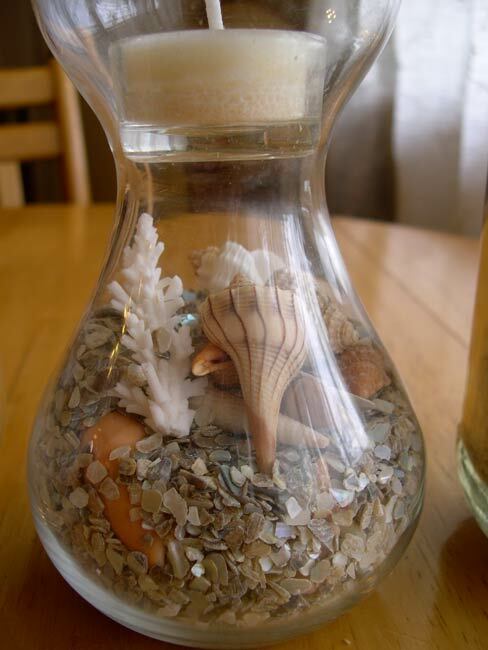 You've seen lots of shells in vases, but I like actually gluing them to the outside of a vase. This first one is filled with vintage-style silk flowers I bought at Michael's a few years ago. 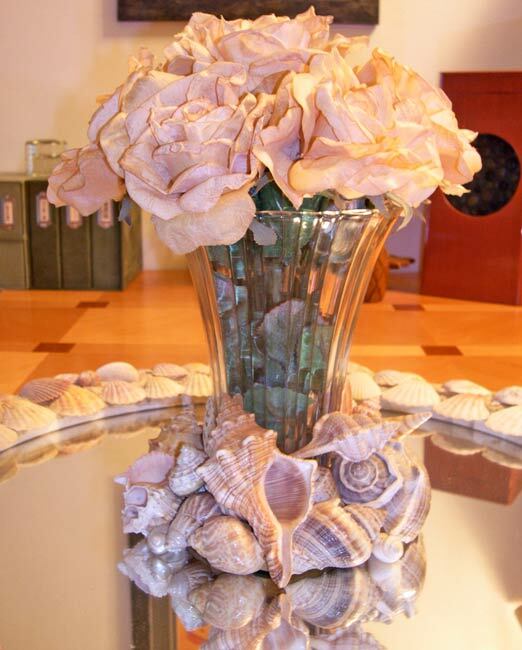 I'm trying to incorporate my love of seashells and roses in my new place. Before my bedroom was all rosy (with a few shells, of course) and other areas were "shelly." Now, anything goes, so it's all going together. This next one is empty, I usually have this on my little dining table in the front window, full of coral and other sealife, but it also looks lovely filled with wildflowers. I made these both in 1999, they've been washed numerous times and have held up exceptionally well. Don't let anyone tell you to use a glue gun when working with shells, they snap off and you can forget about being able to give it a good washing. I use Goop — the one made for plumbing, it forms a flexible seal, is waterproof and obviously holds for years and years. Note: I set both of these vases on top of a seashell mirror that I'm working on to take the photos. I like the effect and will be keeping my eye out for a few smaller round mirrors. Here are just a few of the vessels holding shells that you'll find around my house. They are useful for lighting during a power outage, a romantic evening, taking outside for the patio tables and they're just darn cute. This one is filled with "sand" from Sanibel Island. Actually this is what you get when you scoop up a few handfuls of crushed shells there and if you look closely you'll find absolutely perfect teeny, tiny shells. I have four just like this. The jars are from a chicken chili I bought last winter to have on hand. They were on sale — Buy One Get One. I wanted the chili anyway, so I consider these containers were FREE, plus I love recycling with a purpose. Cost me nothing to pick up the shells and I found those little glass tealights at Goodwill — 6 for $1.39. Total cost of each one? Less than a quarter! 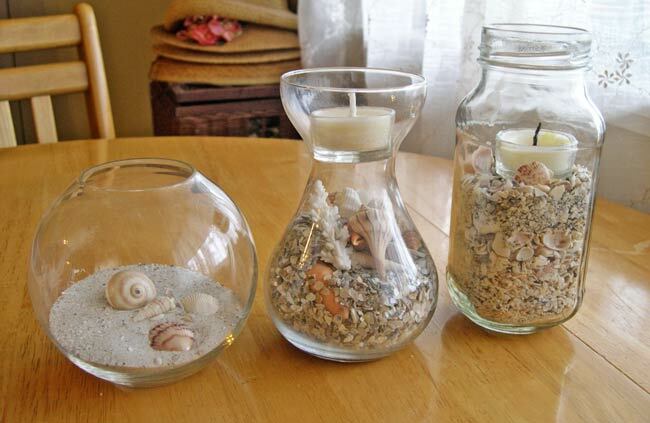 Four beachy candles for less than $1.00, doesn't get any better than that! This container is for forcing Amaryllis bulbs, but I love the shape and the top holds a tealight perfectly. The "sand" in this one is actually crushed abalone shells, I love how it sparkles in the light, it's like nature's glitter. Then sometimes simplicity is nice. The sand in this one is actually sand, yes really it is. 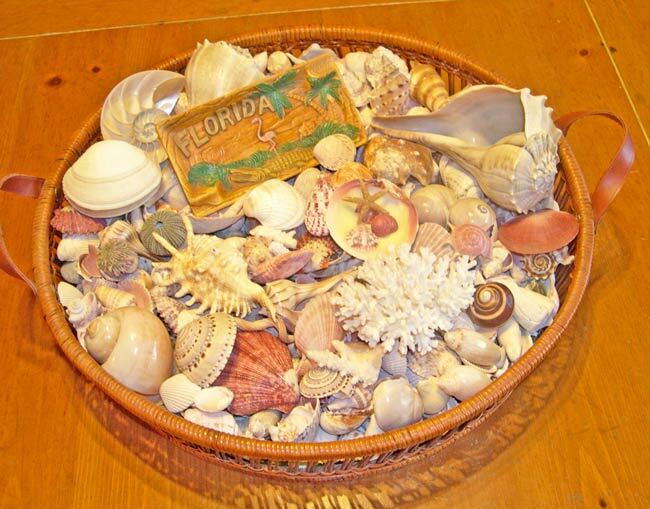 The sand is from the beach by my old house in Florida and the shells were all picked up there. There you have it, a small peek at just a few of my shells, believe me there are thousands more! I've been beachcombing all my life and my mother was just a addicted as me, so you'd think I really don't need any more, right? Have a beachy day, if only in your heart. Although when I was a child we called all sea shells "coquillages", the coquille was usually used to refer to the shell ON an animal (living). And I'd have given you an A+++++++ for that work too! Taxonomy collections can be very difficult to put together, both in the collecting, conserving, id-ing and presenting. I had to one for local flora and insects in college... hard! I love these ideas. My mother has lots of shells she was trying to give me, that I didn't want. Hmmm, I am rethinking that one. I love the 2nd vase (the empty one), it's so pretty! I also love the mirror w/shells too. And... of course you should name your condo and what a fitting name it is! Your shell displays are gorgeous! I love your coquillage. I'm SO happy to know that about Goop instead of hot glue. No wonder! You just saved me. I will remember that in future projects. I have to make some repairs to a mirror that the movers had fun with years ago. Thanks! You'll always be Shelle to me!.. and I adore the new moniker..
perfect for you and your casa..
thanks for the mention and I think you picked a very relevant name for your new abode. Maybe one day when the kids grow up, etc I can have a name for my house. Right now my husband calls it the island of misfit dogs. 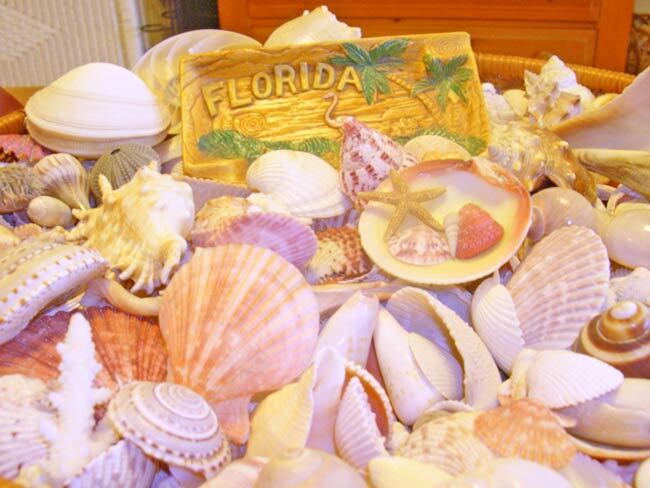 Maybe I'll find a few shells when we vacation next month at Anna Maria Island. 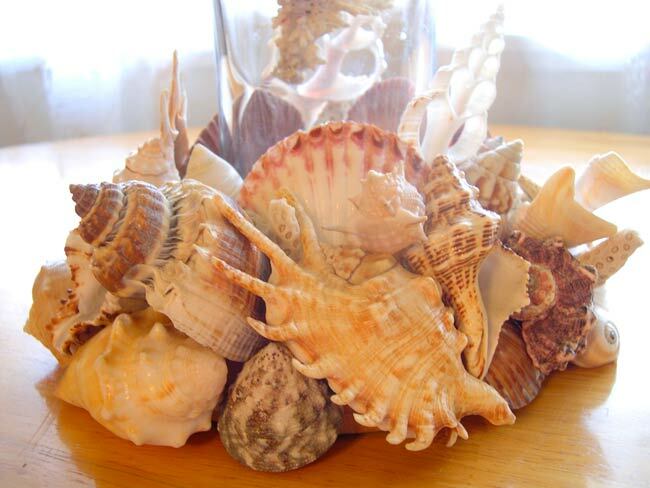 Love your shell collections Rhonda! I especially love the vases you made. They are gorgeous! I like the name of your new abode! 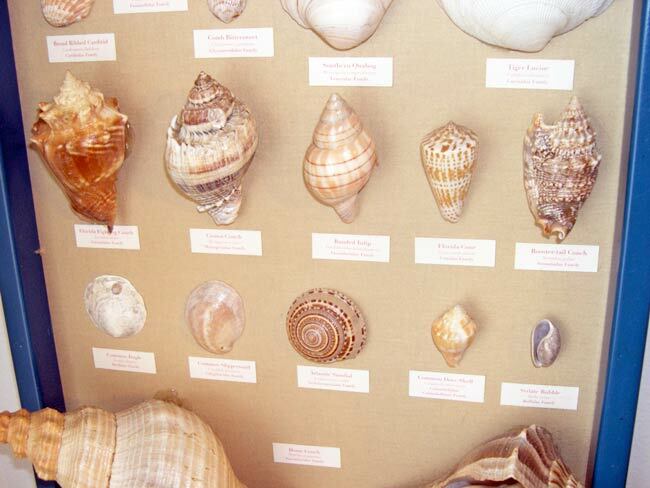 Oh, Rhonda..., your shell collections are awesome!!! And I love, love your house name! The word coquillage has such a good sound to it. You'll be my next "Inspired Readers" feature! My goodness you have tons of shells. My favorite is the basket!! I had a funny dream the other night.........about your new dishes!! I love your home's new name! Phonetically, is it pronounced ko-kee-loj-es ? or ko-kee-loj-a ? Your shell designs are fabulous. You are quite a shell crafter! The PERFECT name! 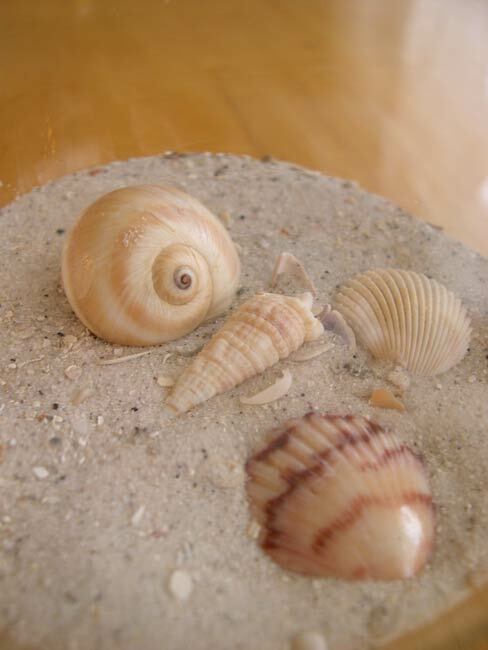 Thank you for showing some of your shell creations. 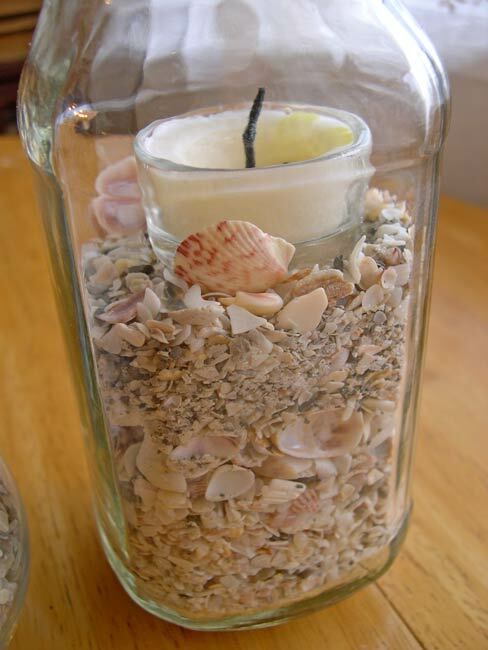 I love the idea of adding shells to the outside of the vase. Clever!!! And thanks for the Goop tip. I would never have thought of that. And your shell creations ROCK!! ah- ha! koh-ki-lahzh . Love it! I also would have given you an "a" on your shell identification guide. ;) Great idea to send guests to it. Fun! Oh my goodness. I have never seen so many gorgeous shells. Since I live in the desert, we only have what you can buy at the craft store, and none of these beauties are available. 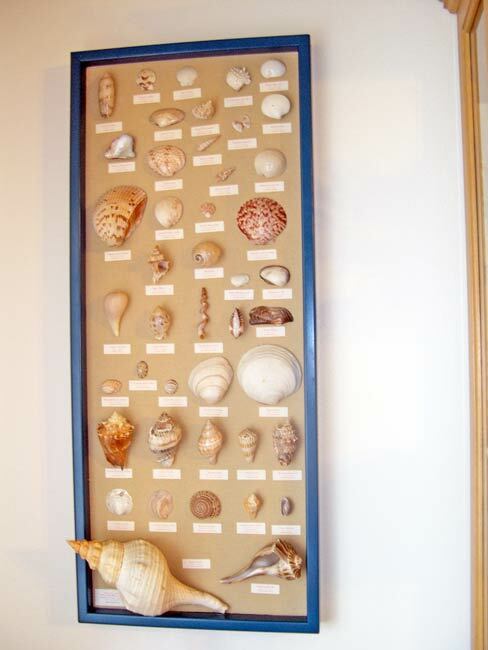 I love your display case and your wall piece showing all the different shells. The vase with all the shells around the bottom is breathtaking. Did you make it. It is just wonderful. 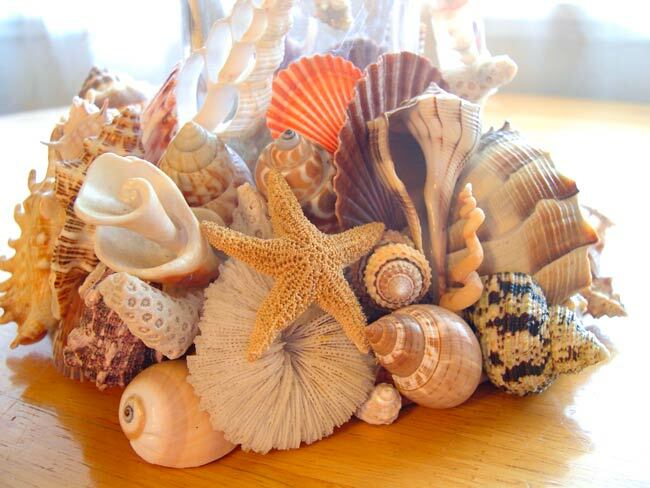 What fabulous shells. I especially like the way you used the bulb vases - very clever. Thanks for sharing your beautiful collection! WORD to what everyone has said about your beautiful shells! and you've given my great ideas and like jane said....Love the vase! Gonna make that!! I've got to go dig up thepicture of the shell id chart I found in one of the islands in the Bahamas done like yours....only very primitive. You'll love it!! Love your cottage name and would also like to know how it's pronounced. Our lake house name is Rio Bonito...."beautiful river"! Every home should have a name...it gives it flavor!!!! OMG! 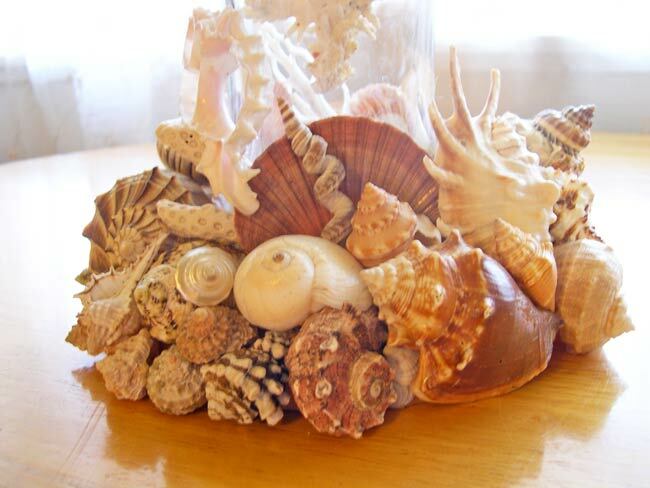 I've died and gone to seashell heaven...love all your displays! Thank you so very much for mentioning my blog in your lovely post - You're a wonderful beachy friend. The roses and shells look lovely together! After all, most shells are very feminine colors... pearls & pinks. 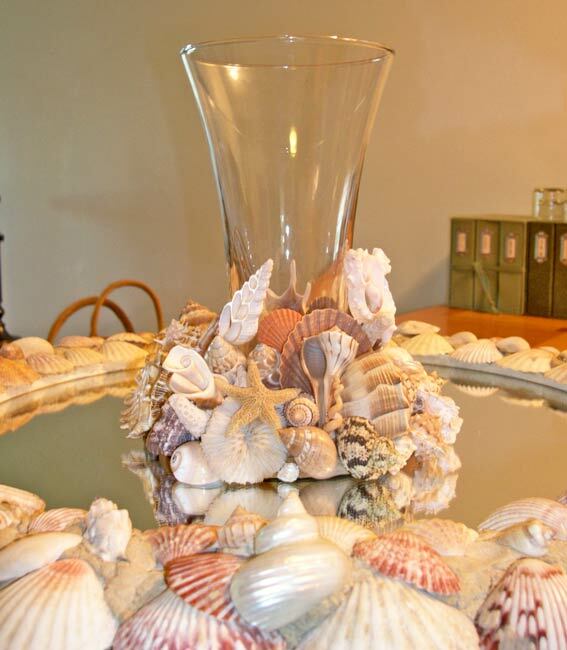 I especially love the vase with the shells climbing up the base. Funny coincidence... I was cleaning in my closet yesterday, and spotted a plastic grocery bag tucked away in a corner. I picked it up to see what was in it... SHELLS! From my last beach trip! I gave most of my shells to my daughter for her aquariums, but these I was saving for my flower garden. I just found your site and I love it. I too, live along the coast......on the Pacific tho. And so I love shells of all kinds. I especially love these vases. I would have posted a comment sooner but I was drooling all over my keyboard!!! Oops maybe some things are better left unsaid. hehehe Just found your site and am LOVING IT!! I've been collecting shells and thought I had quite a few until I found you. Cutos to you for all of your projects, I'm a bit slow on the projects but not that you have given me this wonderful mirror idea and vases to boot..........well, let's just say I'll be away from my soggy keyboard long enough for it to dry on it's own. Thanks for sharing your treasures! Love your collection! You have some great ideas here! By the way, my name is Shelley. I go by "Shell" but for some reason I always write "Shelley" on my blog! Best wishes for the new year! What a great post this is! Love how you are displaying your shells. And your school project is awesome.